Genuine Canon 0899A003 (BC-21e) Print Head, use the BC-21e printer ink cartridge / BCI-21 tanks for printing color documents. The BC-21e contains the print head unit and two replaceable BJ tanks - the BCI-21 color BJ tank and the BCI-21 Black BJ tank. When you run out of ink, you can replace either tank without replacing the cartridge. Also fits some Apple, Calcomp, Mannesmann, Nashuatec, Panasonic, Rex Rotary, Ricoh, Saven, and Selex printers. 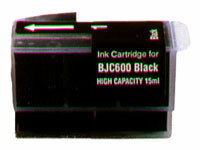 Canon 0947A003 (BJI-201C) Cyan Compatible Inkjet Cartridge designed to work in the BJC 600/ 610/ 620/ 630 Series copiers. Also fits the Apple Color StyleWriter Pro, Calcomp TechJet 5330, OCE-5100, Selex S900D/ S900E, and Tektronic 4686 Phaser 140. SEE NOTE BELOW! Canon BJI-201HCBK Black, High Yield, Compatible Inkjet Cartridge designed to work in the BJC 600/ 610/ 620/ 630 Series copiers. Also fits the Apple Color StyleWriter Pro, Calcomp TechJet 5330, OCE-5100, Selex S900D/ S900E, and Tektronic 4686 Phaser 140. 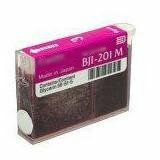 Canon 0948A003 (BJI-201M) Magenta Compatible Inkjet Cartridge designed to work in the BJC 600/ 610/ 620/ 630 Series copiers. Also fits the Apple Color StyleWriter Pro, Calcomp TechJet 5330, OCE-5100, Selex S900D/ S900E, and Tektronic 4686 Phaser 140. SEE NOTE BELOW!